I am sorry to break this to you. Despite the fact that you have 15K tweets, 100K followers and call yourself a power user, you are not a customer for twitter. At best the term user describes you and I. At worst we are the raw materials. The real customers are those who pay for its value. So brands that pay for the data, get in front of us with messages and get us to do something are the real customers for twitter. There is nothing wrong with that. Just making it clear. Three recent major product announcements from twitter reflect their realization and focus on its customers. Direct Message Changes – They removed the 140 character limit on DMs and added group messaging capability. I do not have data on how many DMs are exchanged between non-brand users as way of communication. Anecdotally I can say all DM I received are promotional messages sent using a third party broadcast tool. I do have data on length of email messages that serve as proxy for DM length. We most likely will use twitter DM only as a mean to communicate privately with those with whom we do not have other connections – i.e., no email address, whatsapp, phone for text etc. There is no reason to believe DM pattern will be any different from emails. 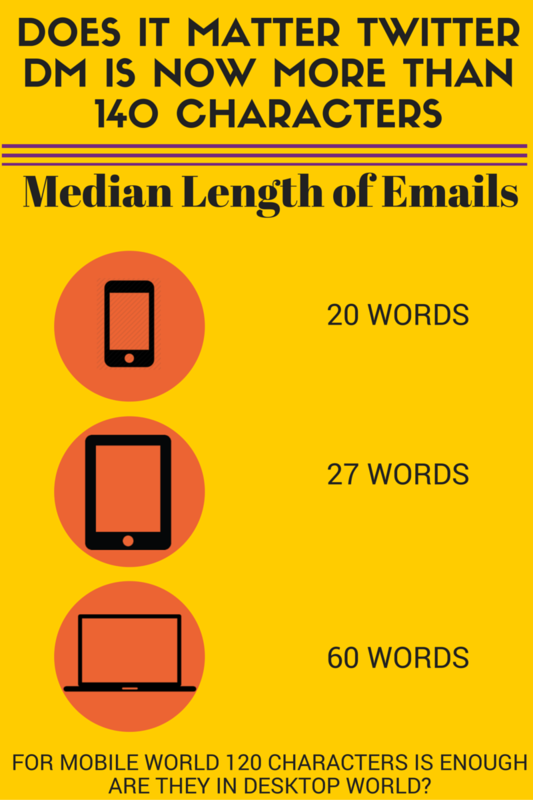 A recent analysis by The Journal says our median length of emails sent from mobile phones is 20 words. At an average word length of 6 (with spaces), 140 characters is more than enough. And more and more of our usage is moving to mobile and tablets from laptops. So the the only possible explanation for a DM feature couched as user experience enhancement is to help brands send longer messages. Moments – It is positioned as a way to get those new to twitter get to know it. For “power users” a way to find hand curated happenings. Do we really lack ways to find what is happening and popular? The different News apps use algorithmic ways to serve us what is popular and (remotely) relevant. That is a crowded field and some of popular darlings like Flipboard are being crowded out by platform players like Apple. So the only possible use case is for brands to insert “Paid Moments” and have Moments integrated into the timeline. Poll – This is a annoyance to all of us, users. And if you are a marketing research practioner you will be up in arms about how silly it is. It is as scientific as Fox News poll asking its viewers if Hillary Clinton is hiding something. Don’t even bother publishing your results from a twitter poll you did on your followers. The only valid use case is for brands to get people to interact with it. The results the brand will collect are immaterial but a crazy enough poll question will get the question and the brand in front of more people. A simple click of button makes it a low calorie effect than typing a reply. Brands will use it simply as awareness generation tool. Our timelines will be filled with such silly polls. Overall I see three new product features that are not about users but about brands. That is fine as twitter has to build products for its customers. The focus is on customers not users. 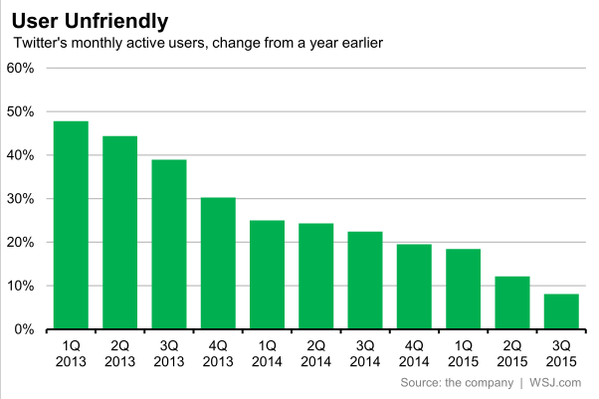 That explains the declining user numbers. Will your thoughts be featured next in this guest post series? Write yours now. We used to MySpace, email, write letters-to-the-editor, etc. Now we tweet. I have seen several reports that collect and analyze millions of tweets and tease out a finding from it. The problem with these reports is they do not start with any hypothesis and find the very hypothesis they are claiming to be true by looking at large volumes of data. Just because we have Big Data, it does not mean we can suspend application of mind. In the case of twitter analysis, only those with API skills had access to data. And they applied well their API skills to collect every possible tweet to make their prediction that are nothing more than statistical anomalies. Given millions of tweets, anything that looks interesting will catch the eye of a determined programmer seeking to sensationalize his findings. I believe in random sampling. I believe in reasonable sample sizes, not whale of a sample size. I believe that abundance of data does not obviate the need for theory or mind. I am not alone here. I posit that the any relevant and actionable insight can only come from starting with relevant hypothesis based on prior knowledge and then using random sampling to test the hypothesis. You do not need millions of tweets for hypothesis testing! To make it easier for those seeking twitter data to test their hypotheses I am making available a real simply script to select tweets at random. You can find the code at GitHub. You can easily change it to do any type of randomization and search queries. For instance you want to select random tweets that mention Justin Bieber, you can do that. The script has bugs? I likely does. Surely others can pitch in to fix it. Small samples and test for statistical significance than all the data and statistical anomalies.